Mandel JCC Receives Top Fitness Honors Five Years in a Row! The J was voted BEST OF THE EAST Fitness Center by Cleveland Magazine’s Circle East Live Well publication 5 years in a row! The J's Playmakers Youth Theatre was voted Best of East “Dance/Youth Theater Instruction” 2 years in a row! Mandel JCC Receives Highest State Honors for Early Childhood and After School Care Programs. The J's Preschool, Child Care and J-Kids Club After School Care programs received The State of Ohio's highest honors meeting and exceeding the quality standard established by the Ohio Department of Job and Family Services and the Ohio Department of Education. 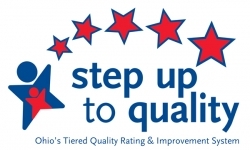 Step Up To Quality is a Five-Star Tiered Quality Rating and Improvement System that recognizes and promotes early learning and development programs that meet quality standards over and above the health and safety licensing requirements. Macaroni Kids East Readers Vote The J #1! Early Childhood - Rated Number One In Quality 2 Years in a Row! The J's Early Childhood full-day and half-day preschool and child care programs were ranked number one in quality 2 years in a row when compared to other large JCCs around the country in a national JCC study. • The Cleveland Jewish Arts + Culture Lab awarded the Zahav (Gold) Award for Programmatic Excellence and User Engagement. • The J’s series of Jewish festivals and holiday wall banners received Kol Ha Kavod (All The Honor) Award for Jewish impact. The J has served as a full-time host site for CEVEC for the past 16 years.